Katie’s practice focuses on environmental litigation, the environmental review of development projects, regulatory compliance counseling, and the environmental aspects of corporate transactions. She represents clients in a wide variety of matters arising under both federal and state laws and regulations. Katie’s experience includes challenging and defending projects under the National Environmental Policy Act, the New York State Environmental Quality Review Act, the Endangered Species Act, and the Administrative Procedure Act. It also includes advising clients on property acquisitions across the United States and guiding projects through the environmental review process in New York. Katie has negotiated settlements in contaminated site cleanups under the Comprehensive Environmental Response, Compensation, and Liability Act, and helped clients address issues concerning the import and export of ivory and species covered by the Convention on International Trade in Endangered Species of Wild Fauna and Flora, the Endangered Species Act, and the Lacey Act. In addition, while at Arnold & Porter LLP, Katie’s matters included representing a fertilizer manufacturer in a Resource Conservation and Recovery Act enforcement action, representing a rodenticide manufacturer in a cancellation action under the Federal Insecticide, Fungicide, and Rodenticide Act, and representing an oil company in an oil spill response and related litigation under the Clean Water Act and the Oil Pollution Act. Katie maintains an active pro bono practice focused on the international natural resources trade. In addition to representing environmental organizations that address these issues, Katie has submitted statements for the record in two congressional hearings regarding the Lacey Act, the United States’ oldest wildlife conservation law. She currently helps develop and present training workshops in Africa to help improve the implementation and enforcement of poaching and wildlife trafficking laws. Prior to joining SPR in 2015, Katie worked in the Environmental and General Litigation practice groups at Arnold & Porter LLP. During her five years at Arnold & Porter, Katie’s practice focused on complex product liability litigation, regulatory compliance, and environmental litigation. 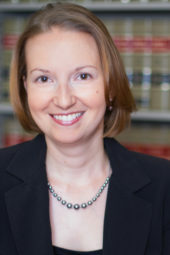 Katie is a graduate of New York University School of Law, where she served as a notes editor of the New York University Environmental Law Journal and was the Co-Chair of the Environmental Law Society. She participated in the law school’s Environmental Law Clinic, in conjunction with the Natural Resources Defense Council, and the Neighborhood Institutions Clinic, in conjunction with the Urban Justice Center. Katie earned her B.A. in Environmental Studies from Vassar College, graduating with general and departmental honors. During college, she interned with the New York State Department of Environmental Conservation.